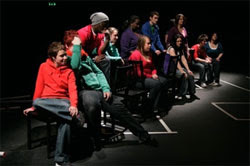 We'd booked up for "Framed" by Visible Fictions because of its concept of Scotland's youth having something to say, and with plenty of previous positive experiences with theatre involving young people, we were happy to give this a go - particularly at £4 a ticket. But perhaps that should have been a warning sign that things were not quite as they at first seemed. Digging a little deeper prior to the show it became clear from Visible Fictions' website that the production was possibly more about developing the young people involved than about producing a piece of theatre for public consumption (with the Prince's Trust Scotland being involved). In truth we debated whether or not we should be posting comment on it but felt the decision had to be made prior to seeing the show, and on the basis that the Tramway website in particular was promoting the show strongly, we felt it demanded the same attention we would give any production seeking an audience - and as always, we don't make any allowances for age, experience etc - all performances are considered in the same way as if they were professional. At the performance it fairly quickly became clear that we wouldn't be seeing a constructed narrative with central themes or issues to raise - this was very much a show made up of individuals each telling elements of their own (and possibly their own) stories. Yes, Visible Fictions have added an impressive technical polish and some very effective visuals but the same effort didn't appear to have been expended on focusing the content. While there are some powerful moments, the applause at the end seemed perhaps more supportive than appreciative. This shouldn't detract from what are no doubt significant individual achievements from those participating in reaching a level of confidence where they could perform - but I do think it raises questions as to whether they should really have been exposed to the wider public as opposed to an invited audience. This is clearly a valuable project but without further development and focus it runs the risk of being unfair on both its audience and participants.